After briefly operating a branch factory since July 1903 at the corner of Howard Ave. & State Street, Berriman Bros. Cigar Co. closed its New York factory on October 31, 1903 and moved all their manufacturing operations to this 3-story 33,085 square feet factory building at 1403 N Howard Avenue. Berriman Bros. Cigar Co. was owned by Matthew W. Berriman of New York City and his brother Edward C. Berriman of Chicago, manufacturers of the Don Cosme, Jose Vila, La Sinceridad, La Evidencia, Marc Anthony, and Light It brands. 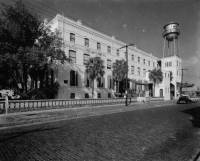 Since their new facility would accomodate only 400 workers which Berriman Bros. Cigar Co. quickly outgrew, in 1910 the Berriman Brothers moved their local manufacturing operation to the Gradiaz, Annis & Co. factory building in Ybor City. Berriman Bros. Cigar Co. operated at the Gradiaz, Annis & Co. facility until 1929 when it merged with the Wengle & Mandell Cigar Co. In May 22, 1910 Berriman Bros. Cigar Co. sold this building to the Morgan Cigar Co. for $110,000 where Morgan moved from their location at 2802 N Howard Avenue. After investing an additional $8,500 in renovations, the Morgan Cigar Co. could accomodate up to 1,000 workers and roll more than 11 million cigars each year. The building was used continuously for cigar manufacturing from the time of its construction into the 1960s when Morgan Cigar Co. was purchased by Gradiaz, Annis, who in turn sold their interests to General Cigar Company in 1964. In the 1970s, it was used as a tobacco warehouse by Gonzales and Sons. It sat empty for approximately 25 years after the cigar industry faded. In 1985, the owner at the time, Gonzalez & Sierra, Inc., sold the building to the Morgan Building Partnership formed by Dennis Mosman, Larry S. Hyman and Thomas G. Dupont. On May 16, 1995 the partnerships sold the property to Historic Morgan Apartments, Ltd, who In February, 1999 sold it to the North Tampa Housing Development Corporation, Inc. After title being tranfered to several government agencies, in April 8, 2004 the City of Tampa, represented by its then Mayor Pam Iorio, sold the buidling to Nicholas Jammal and Jammal Engineering, Inc. The building was designated in 2004 as a national and local historic landmark and renamed the Berriman-Morgan Cigar Factory. Its current owner, Nicholas Jammal, restored the building to the Secretary of the Interior’s Standards and Guidelines for the Rehabilitation of Historic Buildings. In April 2008 the rehabilitated building earned the City-County Planning Commission's prestigious Jan Abell Award. 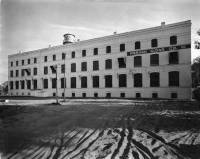 The old factory building is now the home of Argosy University .